Boris Todbringer and Middenland. The wait is not funny anymore. At least give all the units and weapons mentioned in the actual 8th edition army book. Celestial Hurricanum and Marksmen with Long Rifles would be a welcome addition, even more so if they come with an implementation of the detachments rule. What lores do LM and HE get in Tabletop? I think if empire gets all their lores so should the rest, unless it's really gamebreaking balance wise. No fixing needed here this is a good want to have. Everyone who lacks access to the lores they should have need characters giving them access to them. This is kinda ridiculous. High Elves and Slann had all 8 lores and High magic. Skink Priests just had Heavens and Beasts. And having all races have their appropriate lores would really only affect MP balance, so I don't see that as any kind of argument against it. Give us a Slayer Hero! Yeah they can always restrict things in multiplayer that are in campaign if balance is really an issue. Like how we don't have Alistair the white lion in multiplayer. Although in that example we probably should. I just want Marius. And some better mechanics. I'd be happy with that. And sure, activate the babysitter, sorry, toddlersitter. I'd love Marius with some sort of crazy mechanic giving you insane missions. Or just something along Harkon's own insanity mechanic. Pretty much yeah. I just wasn't going to speak to that as I haven't played as him yet so I haven't seen how it functions. Merely know that it exists. 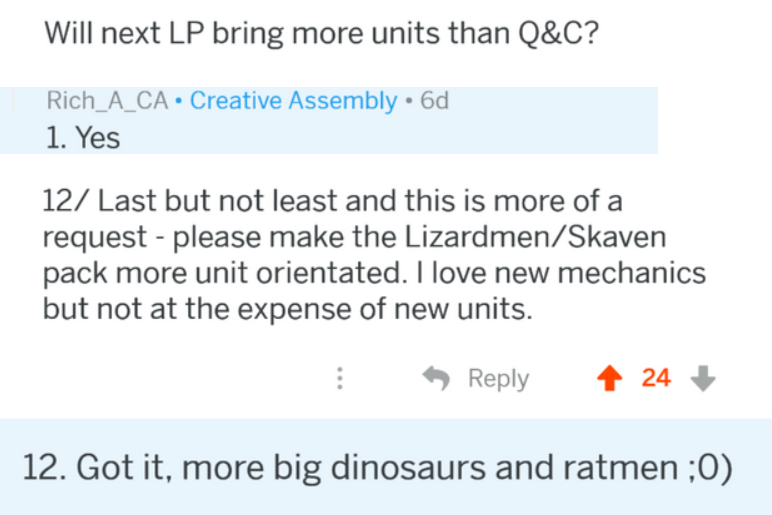 Yes, let just recyle more mechanic for Empire, dont give them something unique, not need. This is what I think too. Everything points towards Game 3 being very Chaos-focused, and you absolutely cannot have a Chaos-themed Warhammer game without the main foil for Chaos: The Empire. On top of everything else that we may or may not get with Game 3, it's not too far fetched for CA to include a fully reworked and redesigned Empire as a playable faction from day 1. Yes, lets just recycle more mechanics for Empire, dont give them something unique, not need. If it fits for the character, that is fine. Uniqueness for uniqueness' sake is not all that particularly impressive. In fact, it would be a waste of time and resources to make a new mechanic when re-purposing something would probably provide a better experience. Recycling the Tomb King crafting mechanic for the Dwarfs, for instance, made perfect sense and fits them nicely. Yes, but Mad Count dont bring nothing to game apart himself. He wont bring subfaction that have new units, or he wont start in place to fight new enemies. He start next to Vamps and all you will do with him is fightning Vamps. Just like Boris he is too close to Reikland itself. Hardly! Yes, he starts next to the VCounts. Because of that he can act as a check on their power since the Autoresolve mightn't be so far in the VCount's favour in that region now. You'd be able to deal with the VCounts first too. But he does bring new enemies into the fold. Do not forget Blackfire Pass. Playing as the Empire I very rarely find myself actually dealing with the Greenskins properly. Marius would be quite able to do so. Arguably he has a decent shot up north through Sylvania too. I mean, as Marius, it makes sense to go through the pass, buddy buddy with the Dwarfs, and then take over the Southern Realms. Then have a real Greenskin bash. Its absolutely something you can do. Ludvig Schwartzhelm, Legendary Hero that can one man entire chaos armies. That is all. And that all he give us ? hardly worth time to even add him. Where are new units ? ah, He wont give us new. New Lords ? Nope because Ca "love" Empire. Fightining Vamp and GS is not something I wonna from new Empire starting positions. How many new units came as FLC with a FLC Lord? Didint Morghur came as free addition to WE dlc with new units for BM ? And Marius is best to be free LL, or was for Empire in game 1. For rework he add way to little. I think a Revamp is not enough for the content I would want to be added. I’d happily pay for a straight Empire booster DLC pack. Amethyst Wizard and Celestial Hurricanum. I’m actually okay with Gold not being added as it makes Gelt more special but for me the other two are absolute must. Ludwig Schwarhelm and Markus Wulfhart as Legendary Heroes for Reikland and Middenland respectively. Limited Provincial units for each province. Eg: Hochland Longrifles. What are you expecting? Kurt Helborg in Araby or Elspeth Von Draken in Lustria or whatever? If you've been keeping track, CA's been rather reluctant to mix Old World Lords with New World start positions and vice versa. Given the trend, it's only reasonable to suspect that any new LLs for WH1 races will start in the Old World and for the Empire that pretty much means within the Empire Provinces. Also for the record, only 1 or 2 new units have been added alongside FLC LLs. It's clearly not something that should be expected of every new one they add. 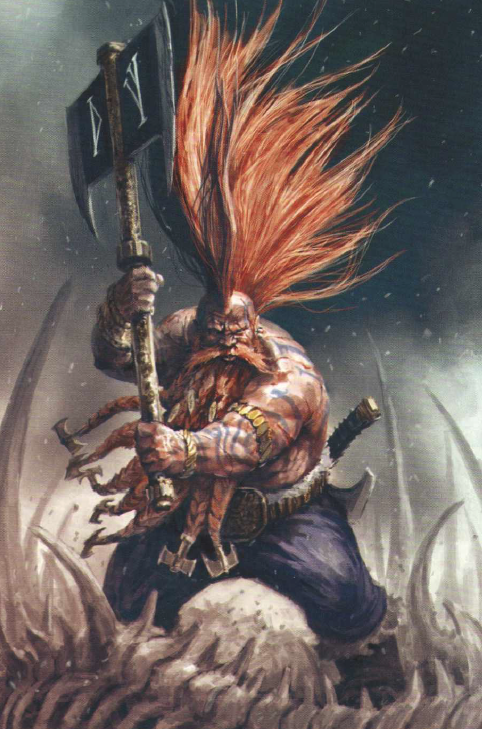 And in the case of Alith Anar's free unit, they were only added because his actual themed unit, the Shadow Warriors, were locked behind a paywall; they couldn't justify adding him without giving him some troops to buff since there's no guarantee that someone who wants to play his campaign owns the DLC that Shadow Warriors come with. And hell, if a free unit were mandatory for a new LL, which they're not, there's plenty of options for Marius. Just take your pick of any unit from the army book which is currently missing; Celestial Hurricanum, Archers/Huntsmen, or one of the Knightly Orders. TBF Helborg has actually been to Araby since he's the only Empire Character who has been outside of the Old World. So...the Light's vaunted justice has finally arrived. Shall I lay down Frostmourne and throw myself at your mercy, Fordring? The north eastern part or at least the north of the Empire is really the only place with in the empire that would be interesting, like a "kislav" faction. Otherwise I would rather have a New World or Southlands colony faction. Putting another faction in the southern part of the Empire would be a waste. The Vampire Counts and Green Skins just need to be scripted and balanced to be more tolerable or influential with in the Empire (depending). The southern Empire is the primary game play around Reikland. Unless Reikland is overhauled to play more similar to the Emperor of the HRE in EU4 where you're managing internal politics and religion. Another south Empire faction would just be dull. *I'm using Reikland as a synonym for "The Empire" faction to avoid confusion. Lead by the craven, torn apart by the greedy, weaken and exposed. Yes Kurt Helborg is good idea, because unlike Marius, he is new Lord type and can give us Grand Master Lord, as well as He can start outside Old World. Non of Knight orders fit Marius, because both od those orders that are missing from AB are from Middenland. Huntmen fit middenland better too. Only Celestial maybe a thing, but that unit wont be add, because its too damn expensive for CA. For sure, I completely understand the logic and justification of it. But there's not a single LL you can point to at the moment who comes from an OW race and now starts in NW territory nor is there a NW LL who starts in the OW despite compelling arguments for a couple, namely Queek and Tretch. It's all a bit moot anyway since we haven't even gotten a new LL for a WH1 race since the launch of WH2. Empire is only core faction of game 1 that havent get free LL, so putting Kurt in New World is not bad idea a all. I'm not saying it's a bad idea, I'm saying there's writing on the wall that suggests CA is unwilling to place OW Lords in the NW. And if they were going to put an Empire character in Araby, my bet would be on Gelt; not that I agree with or endorse that idea, in fact I'm 100% against it. It's just that it seems like CA's taken the easy way in situations like this before.